Baddie Bey posted this picture to her instagram and tumblr rockin' a 3.1 Philip Lim Ka-Pow comic Print Sweater which can be found at Saks Fifth Avenue. Baddie Bey was stunting on instagram with her new "Baddie Bey Style" and I am love with this look. With this look Bey rocks a Criminal Damage Leopard Print White 91 Sweater from ARK. The cap that she is wearing is "In My Mind" by IamRonBass which was also worn by her hubbie Jay. Bey made this outfit stand out with a pair of red pants. With this look Bey just went all out with the Ragged-Bone which is catching a lot a people's attention. Bey looks "Jazzy and G'd Up" and she posts this pic to her tumblr and instagram. 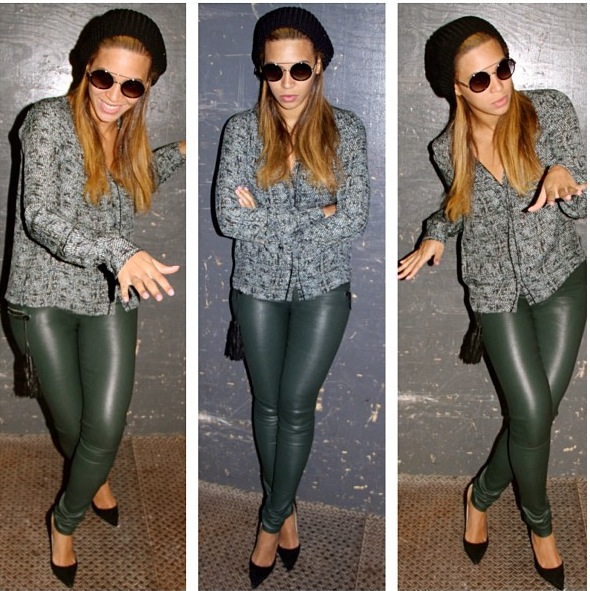 Everyone is getting into the whole leather frenzy and Bey is giving us all of it with this Green leather leggings. ....Bey just does not stop with these fabulous fits. Another Ragged Bone fit but I am adoring this color pants, I mean who would not! ... Rocker Chic Bey gives us a Rock look with these En noir Leather Sweatpants, fashioned out of soft italian lambskin leather, the pants have a black waxed nylon waistband drawstring, gold zipper, and elastic cuffs.